You'll now able to enjoy virtual reality videos in 8K with smooth latency through the standalone, wire-free Vive Focus headset, at least if you're in China. The matter-of-factly named Visbit 8K 3D VR Player is the result of a partnership between HTC and virtual reality streaming company Visbit, and for the time being, the two companies are offering the feature through HTC's Viveport marketplace in China for free. The big sell, though, is Visbit's View-Optimized Viewing (VVOS) technology, which displays such high resolutions without the framerate issues that tend to plague VR (and which are partly responsible for VR's tendency to make users want to barf). The technology to capture 360-degree videos in 8K for virtual reality has actually been around for a while, but up until now there's been no VR player that's capable of handling it. That's good news for companies like Kandao, whose CEO Dan Chen expressed relief in a prepared statement that the new player will allow the company to stop compressing its footage down to 4K. Last year, Kandao released two 360-degree cameras from its Obsidian line that could capture in 8K, but it was hard for viewers to see much difference from 4K with the compression. With Visbit's player, cameras like the Obsidian will be able to shine. Unfortunately, the Vive Focus is only available for customers in China, which is a shame since it comes with an impressive 3K AMOLED display. 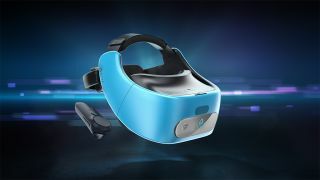 On the bright side, the HTC Vive Pro offers similar specs, which means that Visbit's player could eventually make it to the newly announced device. Keep in mind that a bit of a delay probably won't be that much of a nuisance, particularly since there isn't that much 8K VR content available at the moment. The best VR games you can play right now!